New research shows a cord management technique, like delayed cord clamping, helps preemies born via C-section, and could hold promise for full-term newborns as well. You may have heard that delayed cord clamping (DCC), waiting to cut the umbilical cord until all the blood has flowed back into baby, has health benefits for your newborn. But doctors are taking things one step further with a new technique called "cord milking": actually pushing the blood back toward the baby with their fingers right after birth. A study published this week in the journal Pediatrics proves that the positive effects of milking for preemies born via C-section actually surpass those of DCC, and researchers think there may be benefits for full-term infants as well. The study randomly assigned babies born at or before 32 weeks of pregnancy to receive either milking or delayed clamping. The babies born via C-section whose cords were milked had higher blood circulation, blood pressure and red blood cell levels. Among the babies born vaginally, the researchers saw no difference between milking and DCC. The researchers theorize that after a cesarean, the uterus doesn't contract the way it does after a vaginal birth, so simply delaying cutting the cord isn't enough to move the blood back into baby—it needs to be helped along manually. "In vaginal birth the uterus can effectively contract around the placenta, allowing blood to be transferred to the baby," the study's lead author Anup Katheria, M.D., a neonatologist at the Neonatal Research Institute at the Sharp Mary Birch Hospital in San Diego, tells Fit Pregnancy. "I believe that cutting the uterus and the extra anesthesia during C-section are the reasons why delayed cord clamping may be less effective than cord milking." During a C-section, the OB may not want to delay clamping because it could put the mother at risk for hemorrhage. But because milking can be done quickly (the study says it can be performed within 20 seconds, as opposed to a full minute of DCC), it provides advantages for the surgeon—and this could apply to the deliveries of full-term babies as well as preemies. 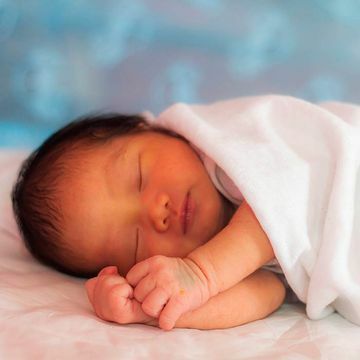 "The idea behind cord milking in any infant is that the obstetrician need not wait to hand over the baby to the waiting pediatric team," Tonse Raju, M.D., chief of the Pregnancy and Perinatology Branch of the National Institute of Child Health and Human Development in Bethesda, Md., which supported the study, tells Fit Pregnancy. "Cord milking has been done in term babies for the same reasons [as preterm babies]—that is, after a C-section the surgeon is preoccupied in taking care of the mother, so the pediatric team can do the cord milking and the surgeon can complete the procedure on the mother." Cord milking is still a somewhat new concept, and no official organizations, such as the American College of Obstetricians and Gynecologists, have endorsed it yet. "We don't know how common the practice of either delayed cord clamping or cord milking is in the U.S.," Raju says. "In a few scientific meetings I have tried to do a poll, and it appears that about 20-30% of hospitals may be doing this. This is my guess." He believes that cord milking, while still more rare than DCC, is growing. "More and more people are becoming aware of this, and I personally have been invited to give talks on this topic by many leading centers. That makes me think that folks are planning to develop local protocols to incorporate these into their practices." Should you ask for cord milking at delivery? If your pregnancy is high-risk and you think your baby might come early, Katheria advises talking to your doctor about the benefits of cord milking—especially since, according to the study, as many as 90% of preemies are born via C-section. "If obstetricians are planning on cutting the cord right away then yes, cord milking can be requested since it provides the benefit of additional blood and stem cells without delaying the surgery," he says. For low-risk women who expect their baby to go to term, Katheria says more studies on the benefits of cord milking are needed before he can recommend it over DCC. But Raju notes it's still worth having a conversation with your doctor. "I think it is appropriate for all pregnant women to ask the doctor questions during their prenatal visits about their policy concerning cord management after birth. They can ask if the doctor has a protocol for cord clamping duration under various circumstances like normal delivery, C-section, preterm birth, etc.," he says. "Whether or not one method, delayed clamping or milking, is better than the other, there is no clear answer. However, almost all studies have concluded that there are many measurable benefits by doing either of these procedures."